The material is conveyed up to the top of the con-tainer from the bottom and then flows back down again at the sides. This is suitable for the proces-sing of heavy mixtures such as mortar, plaster, cement, and sand- and pebble-filled materials. The mixing tool works into the material easily with a screwing action. The professional mixing tool - specially developed for tough service on the building site. With three mixing blades for fast working with high shear forces, for thorough mixing results. It requires the use of a suitably dimensioned drive machine. Fea-turing particularly high-quality workmanship and high-grade steel for a long life, even with abrasive materials. 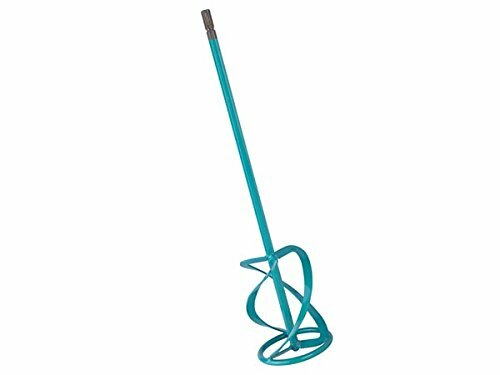 Mixing tool is made of steel, unless stated otherwise, with a powder-coated finish in RAL 5018, turquoise. Ideal for heavy and highly-viscous materials. Particularly suitable for plaster, mortar, screed, concrete, quartz-filled material, etc. 16mm minimum drill chuck. 30kg - 60kg Mixing load. 200 - 300 rpm rec. 1200W Drive.